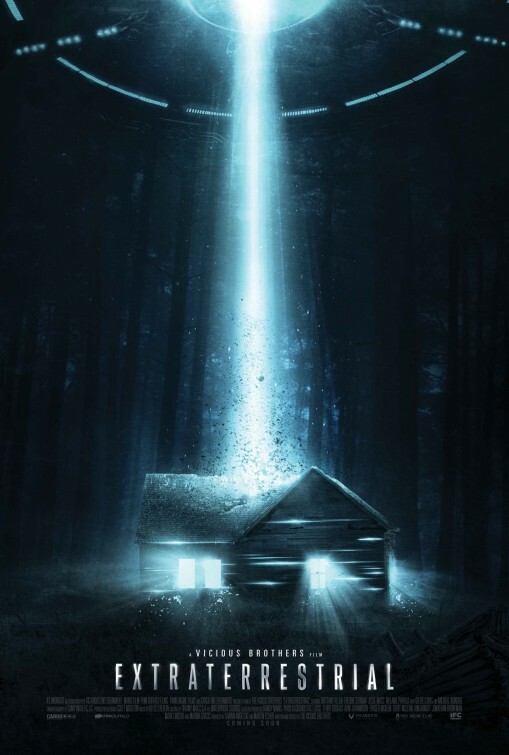 Extraterrestrial is a film from The Vicious Brothers (Grave Encounters) and the story puts a nice little twist on an age old horror plot line: college kids going to party at a cabin in the woods. But instead of zombies or evil spirits coming to crash the party, this group of coeds gets a visit from aliens. And with that fun sounding set up, let the party begin. April (Brittany Allen), accompanied by her boyfriend Kyle (Freddie Stroma), is sent by her mother to take pictures of the family cabin to get ready to sell it. This automatically makes the characters a tad more relateable as they are being sent to the cabin for a reason and not just to party. April seems genuinely sad that they are selling the cabin, as that and her parents divorce symbolizes the loss of her childhood and innocence. But Kyle invites some friends and the partying begins as soon as they arrive. There is a nice human element in the movie as April and Kyle are in danger of reaching the end of their relationship, and right in the middle of an argument we see a UFO fly over the cabin and crash not far away. It's a fantastic touch that ups the stakes and makes these characters that much more human, and that the UFO interrupted and crashed right in the middle of a dramatic scene was jarring and unexpected and very well done. From here the movie only speeds up and we get plenty of action and scares as the group fights/runs from the aliens. The ensemble cast as a whole is pretty decent all around, there are no bad performances that distract from the other actors at all. The standout is definitely Brittany Allen, who does an excellent job here and conveys a lot of raw emotion. Her performance reminded me greatly of another breakout performance from last year, Alex Essoe in Starry Eyes. We also get a nice little turn from Michael Ironside as a pot growing Vietnam vet who may not be as crazy as he first comes across. The movie does offer a number of old cabin-in-the-woods/horror standbys such as finding a bunch of home grown marijuana, a fallen tree blocking “the only road back to town,” and lots and lots of rain. But these tired horror tropes almost feel like old friends at this point and given the alien twist in this story it was almost comforting to see them still show up as obstacles regardless of what/who it is that is terrorizing our main characters. There is a very well done moment where they acknowledge the rainfall when it stops when Kyle notices and says, “at least it stopped raining.” The reason for the rain stopping and the way the sequence was filmed is great stuff. Extraterrestrial is a dark movie washed in alarming reds and blues and greens. The aliens are tall and lanky and nightmarish and when a character is taken aboard their ship it is a gruesome and terrifying scene. The soundtrack is full of loud and clunky, electronic mechanical sounds, deep blaring horns and loud drums for a heroic and constant danger feel at the same time. It's a big and dramatic feeling movie with great effects that reminded me of the films of the 1980's, a sort of Close Encounters/Evil Dead/Fire In the Sky mash-up and I thoroughly enjoyed it. As of this writing it is currently streaming on Netflix and you should definitely check it out.